This is a sympathetic biography of Prince Paul Karageorgevic, who was the Regent of Yugoslavia for a fateful seven years before the coup d'etat of March 1941 and the subsequent Axis invasion. Born in Russia in 1893, due to his father's exile. In 1903, after the murder of King Alexander, he followed his uncle, the new King Peter, to Belgrade. He was educated in Lausanne, Belgrade and finally in England at Oxford. His interests were in the arts, although he returned to Serbia at the outbreak of WW1. He arrived in poor health and despite his uniform, played no military role in the early success against the Austrians, or the subsequent retreat to Corfu and the Salonika campaign. He spent most of the war in England on health grounds. King Peter's health meant that Serbia was ruled by the Prince Regent Alexander, who subsequently became King. Paul married Olga the sister of King Constantine of Greece in 1922. His relationship with King Alexander was mixed and he had very limited official roles. This meant he gained little experience in the complexity of Yugoslavian politics, which were based around trying to keep the disparate nation together. They also faced territorial claims from just about every country surrounding the new kingdom. In 1934, King Alexander was assassinated in Marseilles, and due to the heir King Peter's age, Paul became Regent. He also sought to keep the country together, with a succession of governments, all of which failed to resolve the differences between Serbia and Croatia. Mussolini supported the Croatian resistance and an Italian invasion was not out of the question, if Ethiopia had not kept him busy. 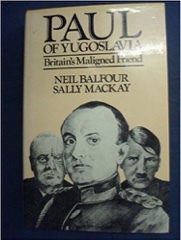 Hitler made diplomatic efforts to encourage links with Yugoslavia and discouraged Mussolini, even after Paul voted in favour of sanctions at the League of Nations. The loss of Italian markets meant economic links with Germany became more important. Britain could not offer the same access, or modern armaments. In June 1939 he made a state visit to Germany and resisted efforts to get him to join the Axis, or at least sign a treaty. Hitler, in a moment of pique, suggested to Mussolini that Italy should invade Yugoslavia. This almost irresistible temptation had to be turned down because Mussolini was unprepared for war that August. For wargamers, this might make a very interesting 'what if' campaign. After the outbreak of war in September 1939, Paul discussed with the French and the British the possibility of an allied landing at Salonika. In effect a copy of the WW1 strategy. Salonika was crucial to Yugoslavia as her only outlet to the sea outside the Adriatic, once Albania was in Italian hands. Weygand turned the idea down because it would take three months to get French forces in position. The British were keener on creating a Balkan Entente, including Turkey. A particularly unrealistic policy that reflected Britain's inability to effectively support their allies in the region. Again some interesting 'what if' campaigns here. Paul even sought a rapprochement with the Soviet Union when the British were again unable to supply weapons and equipment. Yugoslavia did supply the Greeks with horses and other materials during their conflict with Italy. They also blocked German attempts to supply the Italians through Yugoslavia. This takes us to the fateful events of March 1941. Hitler effectively gave Paul an ultimatum to support the Axis, or face invasion. The British urged him to fight without promising any effective support. British intervention in Greece was inadequate to save the Greeks, let alone supply and equip the hopelessly divided Yugoslavian armed forces. The Crown Council reached the conclusion that there was no option other than join the Axis and Paul assented. He believed he was doing so under conditions that would have protected Yugoslavia. However, he was inevitably regarded as a traitor to the allied cause, a view that dogged him for the rest of his life. This sparked a long planned coup d'etat by Serbian officers, which used King Peter, who was just short of his 18th Birthday as cover. Paul made no real effort to resist the coup and was probably relieved to leave the country. SOE had a modest role in the coup, but it was largely exaggerated. Paul and his family went into exile via Cairo, to Kenya and later to South Africa. Hitler responded with an invasion of Yugoslavia, which collapsed with minimal resistance. Followed by a vicious occupation and civil war. Much of this was unfairly blamed on Paul, particularly by elements in the UK Parliament and the press. He died in France in 1976. Prince Paul was undoubtably ill equipped for a role that he never sought, or one that was intended for him. He should have spent his life in the comfortable existence of a minor royal, dabbling in art and other leisure pursuits. However, Yugoslavia was largely ungovernable during this period and the country's geo-strategic position left it with few options. Churchill was happy to propose totally unrealistic options, without providing any practical support. This is a sympathetic biography and the reader is left with some sympathy for Prince Paul. Even more sympathy for the country in ruled for seven years. For me, it flagged up aspects of pre-war diplomacy that I was only vaguely aware of and is certainly worthy of further research. Defending Falmouth - Pendennis and St Mawes.